Provenance / Collectors' marks: This print was discovered in a Charlet scrapbook in the attic of Wesleyan University’s Olin Library in January 1957. It was then transferred to the Wesleyan print collection at the Davison Art Center. The print was removed from page 74 of that scrapbook (a half page of the album was cut out). 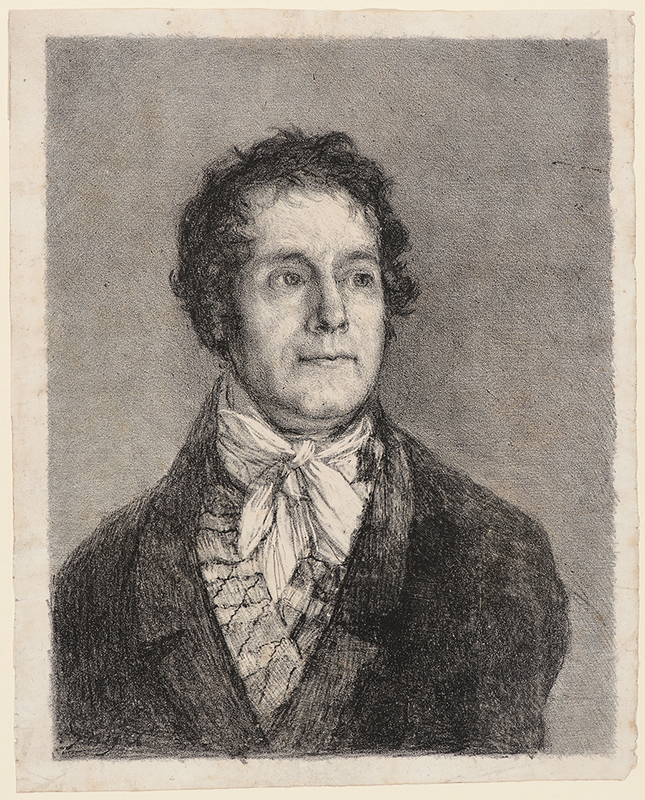 The image depicts the printer Cyprien-Charles-Marie Nicolas Gaulon (1777–1858). Bibliography: Tomás Harris 282; Loys Delteil 284; Sayre 256; Jonathan Brown, I am still learning: Goya’s Last Works (New York: The Frick Collection, 2006), cat. no. 27, p. 16; Stephanie Loeb Stepanek, Frederick Ilchman, and Janis A. Tomlinson, Goya: Order & Disorder (Boston, MA: Museum of Fine Arts, 2014), cat. no. 128, reproduced p. 205; Xavier Bray, Goya: The Portraits (London: The National Gallery, 2015), cat. no. 69, reproduced p. 202, see also pp. 203, 253. Portrait of the Printer Cyprien-Charles-Marie Nicolas Gaulon (Portrait de L’Imprimeur Gaulon), . Crayon lithograph with scraping on wove paper. First state. Image: 265 x 208 mm (10.4 x 8.2 in.). Sheet: 285 x 232 mm (11.2 x 9.1 in.). DAC accession number 1957.4.1. Olin Library transfer, 1957. Open Access Image from the Davison Art Center, Wesleyan University (photo: M. Johnston). http://dac-collection.wesleyan.edu/obj6528 is a persistent link to this page with no user-session information.